Gamasutra: Chris Wilson's Blog - How does 'The Messenger' make you a master? How does 'The Messenger' make you a master? During development of The Siege and the Sandfox, I make time to play through the opening hour of similar games and deconstruct their initial experience. I find it’s helpful to try and figure out what a game is trying to teach, how it’s doing that, and if I think it aligns with the games overall style. 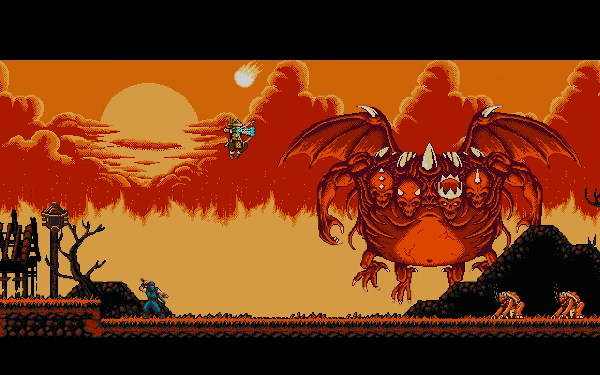 The Messenger caught my eye because it starts off as a traditional action platformer that eventually becomes a Metroidvania. I wanted to see if there are any subtle hints of this to be found in the first hour of the game, as well as what abilities the designers thought were most important for both styles of game. The colour used for the the floating platform we’re standing on is identical to that of the ground on the right hand side of our starting position. This indicates to the player that anything matching this colour is likely to be the foreground layer, and that we can stand on it. We want the player to move to the right. This is further reinforced by the movement at the end of the cutscene, and the facing direction of the player. When we want to be sure a player understands a new technique, we gate them. This means creating through level design an area that can only be passed by correct use of the technique. This gives the player a constrained sandbox, helping them find the solution, but not outright telling them what to do. We encounter the first gate almost straight away - we need to know how to jump in order to progress. This is repeated in 2 sets of 3. This is one of the core mechanics of the game, something that interacts with nearly every other system so it is vital that the player understands it. This is why extra care is taken to explain the technique before providing another gate. A short unskippable cutscene plays, showing NPCs using the technique in addition to providing text to explain how it works. As this cut scene begins, cinema bars come in from the top and bottom of the screen, indicating to most players that interaction will not be required until these bars retreat off the edge of the screen. We are once again gated from further progress until we use the new Cloudstep technique. 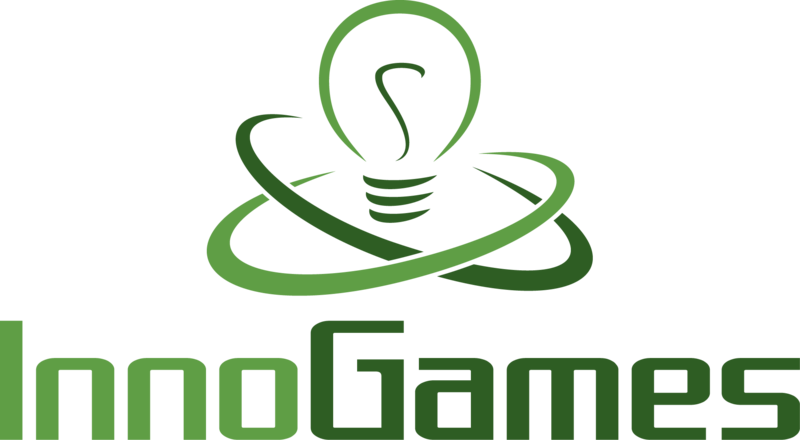 However, this time the game offers additional support to ensure the player understands. NPC characters carry out the move, so you can see what a successful attempt will look like. This is very helpful to explain a new technique to a player, especially if it something unique that they won’t have seen before. Players are given the option to talk to an NPC for additional text information. As this is player directed, it’s unlikely to be frustrating. Once we pass this gate, we can be sure the player knows how to jump, and how to attack. They will also be aware that the two can be combined for the Cloudstep. Interestingly this is immediately followed up with an opportunity to chain two Cloudsteps together, but this is not enforced by a gate as before. You can progress without successfully carrying out the move. This is a pattern that’s often repeated in the game - it encourages mastery of the systems, but doesn’t make such mastery mandatory to progress. It’s also worth noting that while the NPC text description clearly explains that the Cloudstep will work with any attack (including enemies), the player is only shown the technique working with the lantern object. For this reason, I think It’s possible that some players may not realise the full power of the technique for quite some time. However I believe this also may be somewhat intentional - letting the player make their own discoveries as they play. A key part of the initial experience for a video game must, in my opinion, be the motivation to keep playing. A common strategy for building this motivation is to start the game with a prologue episode, and that’s exactly what The Messenger does. Following the Cloudstep tutorial, you drop down a wall that will prevent you backtracking and further. This closes down the amount of space the player has to worry about, and further reinforces the desire to move to the right. When they do move to the right, they will trigger another cutscene which presumably shows off late game content. This does two things - provides a dramatic story beat right away to help with pacing, and start the player anticipating how and when they’ll encounter those enemies. Also, those paying attention will also notice the player gets their first ‘Time Shard’, from an enemy killed by the ‘Western Hero’. However, they won’t be told what this even does. All these elements at the end of the prologue aim to get the player asking questions. These questions can only be answered by continuing to play the game. The initial gating for the jump mechanic didn’t care if the player noticed that you jump higher the longer you hold the button. While this is a pretty common mechanic in platformers that players usually pick up instinctually, it is gated here to ensure everyone understands the difference. As the majority of the backgrounds are static, the animation of the ‘time shards’ draw the players eye. 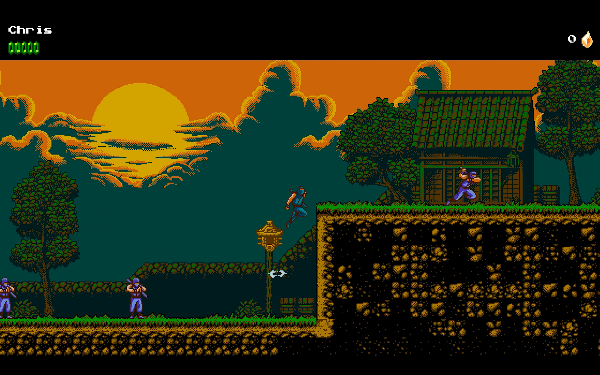 They are intentionally placed within the levels to suggest good movement patterns to the player. This includes signposting good opportunities to use the Cloudstep technique they just learned. The shards will also lead the player into the path of the first enemy. This enemy is slow moving, with no ranged attack. They also start pretty far away. This means that there is a very generous amount of time for the player to perceive it as a threat, and recall the attack button. The next gate ensures players are aware of these destructible blocks. Most players will figure this out pretty fast, but the game provides supporting elements to ensure everyone will come to the same realization. The blocks appear directly in front of the player as they move left to right. On the far side of the blocks we can see a familiar lantern object, so we know that we can reach there. Finally the same foreground colour is used all the way along the floor tiles, indicating a path the player can follow. While the player isn’t directly told to attack, it’s the first button they are likely to press. When they do, audio and visual feedback let the player know they are doing the right thing. 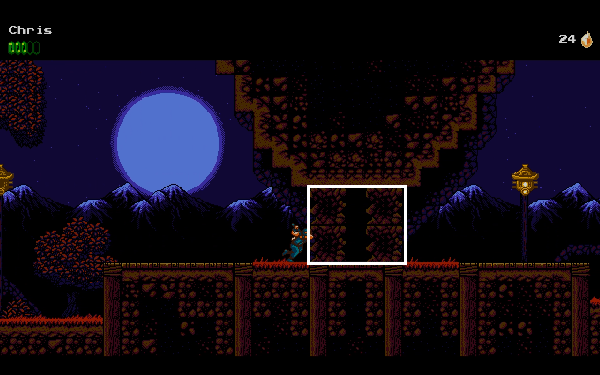 While these platforms have been used in rooms prior to this one, this is the first time the player is gated from progress until they correctly drop through the platform. 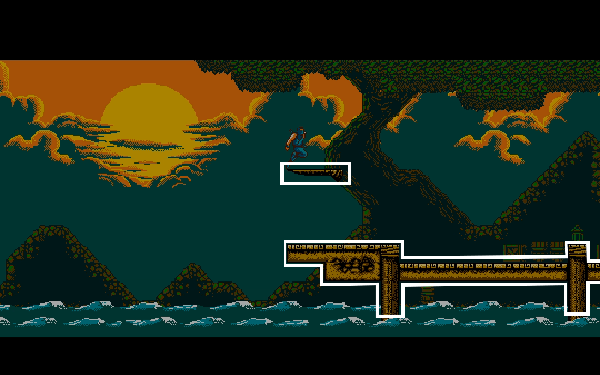 Note how the player cannot backtrack from this location as they can’t jump high enough to escape. The Time Shards are again used to let the player know this is the intended path. 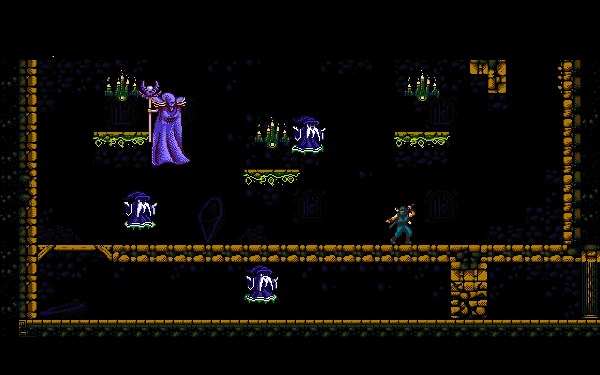 Hinting at what’s to come, the game then provides the player with a textbook Metroidvania unlock loop. Much like the earlier gates, the Time Shards direct the player down into an area they can’t escape. 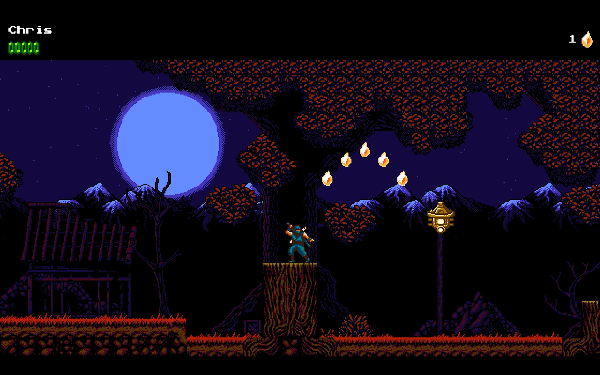 A cluster of lanterns beyond the gate give motivation to the player to return here once they figure out how to escape. Until they happens, they only have on option - the shop. As soon as they enter the shop, they are told how to use the Climbing Claws on the walls via a text box. Now the player returns to where they just were from the shop. They are already correctly positioned, facing the wall they need to climb. This acts as the ‘bounce’ to return the player to that area they couldn’t reach before. During their escape, notches in the wall force the player to jump over them. This makes them aware that they are still able to jump while climbing. As they descend the path containing the lanterns, players are introduced to sections of wall have jagged angles and cannot be climbed. The game also has separate challenge routes for players who want to test their skill. 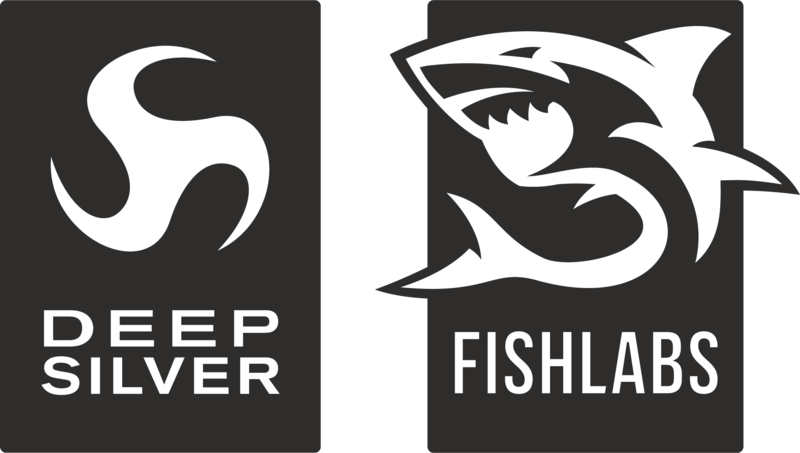 The entrance to these challenge routes have been deliberately designed to go against the natural flow that has been established in the earlier levels. Everything else in the level will draw the players eye from left to right, but the entrance to the first room requires the player to travel in the opposite direction. Going against the grain in this manner makes them feel like a secret, even if they aren’t deliberately hidden. 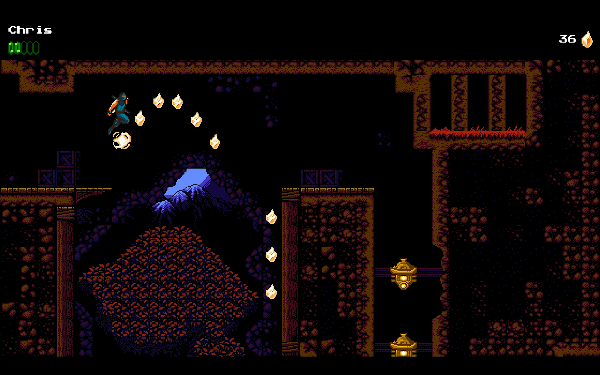 Around the time the player enters the Catacombs level, the training wheels begin to come off as the developer is confident that you understand the basics. New elements such as spikes and crushing platforms are introduced, and quickly combined with a wider range of enemy types. Existing challenges have spikes added meaning the player will now be punished for failure. At the same time, more enemies are placed into small spaces, mixing projectile and movement types. This requires the player to become better at crowd control, as well providing many chances to use the Cloudstep technique. This game takes an interesting strategy in its first hour. Rather than enforcing some of the more complicated moves to ensure players understand them, it ensures the basics are covered and then gentle nudges the player to attempt more complex moves. The game encourages mastery, but it does not require it to make progress. 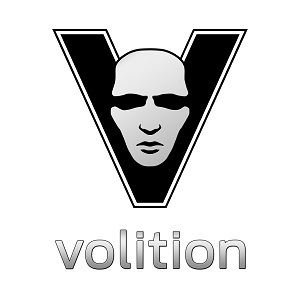 With that in mind, I think they’ve done a great job of building an introduction to the game that mirrors those values.